Having been withdrawn from the market a few months ago, the 57m motor yacht Lady Linda is now listed for sale by Frank Grzeszczak and Bill Sanderson at International Yacht Collection. Built by Trinity Yachts to an in-house design, she was delivered in 2012 to an experienced and discerning yachtsman. Lady Linda offers the last word in floating luxury, style and comfort. Her richly decorated interior was designed by Evan K Marshall in a modern classic style with a variety of high-gloss exotic woods, granite and marble, bespoke furniture and exquisite art work. Lady Linda's 12 guests are accommodated in six spacious cabins. The luxurious master suite on the main deck features a king-size bed, his-and-hers bathrooms and a private study, while located amidships on the lower deck, are four guest suites with king-size beds, all designed with soft, restful tones. The guest suite on the bridge deck has a queen-size bed and can be converted to a gymnasium if required. 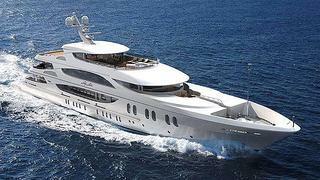 A finalist in the 2013 World Superyacht and ShowBoats Design Awards, Lady Linda is asking $43.9 million.